Much has been written about aerial drones in photography and videography in recent years but now the same technology is available underwater. 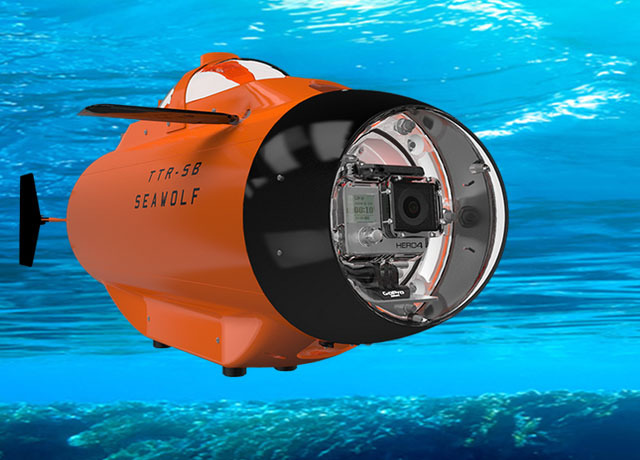 TTRobotix has introduced a remote controlled submarine called the Seawolf. It can carry a small camera for underwater photos and videos. The submarine weighs about 7.7 kilogram (17 pound), 70cm (over 2 feet) long and can dive to a depth of 8 meters (25 feet). It can carry a GoPro HERO3 or HERO4 action camera. The 5-blade brass propellers drive the sub to a speed of up to 3.5kph (2.2mph). The internal battery pack can last up to 50 minutes in between charge.